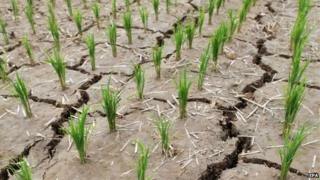 North Korea says it is facing its worst drought in a century, sparking fears of worsening food shortages. State news agency KCNA said main rice-growing provinces had been badly affected and more than 30% of rice paddies were "parching up". Some rainfall was reported on Wednesday but this is not unusual for a country that often veers between droughts and severe floods, according to BBC Weather's Phil Avery. Any rainfall now will not make up for the dry weather in the last few months, a period crucial for the country's agrarian economy, and which has already severely hampered preparation for the wheat and rice crops. The Mei-Yu weather front, which normally moves up from China later on in the summer, may provide more rain - but there is no guarantee that will happen or that it will not cause floods, as it has done in the past. It is unusual for North Korea to talk openly of its shortages so the very appearance of the report in state media is significant. It indicates the situation is serious, and it may well indicate that North Korea wants outside help. The report of drought coincides with the release of two South Korean prisoners from North Korean custody, and that may underline the desire of the North to elicit sympathy and more tangible aid. Polls in South Korea indicate conflicting views - most people support aid to the North but some also question why South Korea should help a country developing nuclear weapons targeted at the very donors of aid. In the last 10 years, the willingness of other countries to aid North Korea has diminished greatly as Pyongyang has developed nuclear weapons. Spending by UN agencies there has fallen from $300m a year in 2004 to the current $50m. North Korea suffered serious famine in the 1990s. Since then, farmers have been given greater freedom to sell on the market and output has risen. However, no water for rice today means no rice for bowls tomorrow. KCNA said rice planting had finished in more than 441,560 hectares of paddy fields "but at least 136,200 hectares of them are parching up". It said paddy fields in South Hwanghae and North Hwanghae provinces were particularly badly hit, with up to 80% of rice seedlings drying up in some areas. It said South Phyongan and South Hamgyong were also "badly affected". "Water levels of reservoirs stand at their lowest, while rivers and streams [are] getting dry," the news agency said. It added that it was planting other crops in rice paddy fields of drought-stricken areas to "reduce damage". Denmark's ambassador to North and South Korea, Thomas Lehman, told Reuters that he had visited drought-hit areas in the North in May. "The lack of water has created a lot of damage to the so-called spring crop, and the rice planting is extremely difficult without sufficient water," he said. Last year the country saw its lowest rainfall in 30 years. Average per capita income of $1,000-$2,000 (£640-£1,280) per year, compared to more than $20,000 in South Korea. For this reason, food shortages caused by the current drought are unlikely to be on the same scale, he says. Other countries, including South Korea, regularly send aid to the North. In April the UN called for $111m (£71m) to fund humanitarian activities in food, nutrition, agriculture and sanitation. Are you in the area? Do you have friends or family affected by the drought? You can share your experiences by emailing haveyoursay@bbc.co.uk.